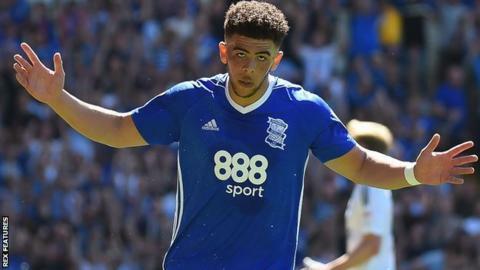 Che Adams scored a hat-trick to extend Birmingham City's unbeaten run at St Andrew's to 14 matches, despite a dramatic second-half comeback by Hull City. The hosts looked to be cruising at half-time as Adams capitalised on defensive howlers from Tommy Elphick and Jordy de Wijs. Fraizer Campbell levelled with two goals in nine minutes after the break, converting Kamil Grosicki's cross and then pouncing after Jarrod Bowen's effort was saved. Poland winger Grosicki put Hull in front when his stunning 25-yard free-kick found the top corner, but Adams smashed home a late equaliser. Lucas Jutkiewicz was the Birmingham forward in form, having scored seven goals in Blues' previous four home games to be honoured as Championship player of the month for October. But it was his strike partner Adams who stole the show, albeit thanks to the generosity of Hull's defence after Elphick's under-hit backpass and De Wijs' misplaced pass. Nigel Adkins had named an unchanged side hoping to add a third clean sheet and a third straight win, but defensive howlers looked to have consigned them to their sixth away defeat of the season before a three-goal burst gave them an unlikely lead. St Andrew's has become a fortress under Garry Monk who has not lost there since his first game as Blues manager against Middlesbrough in March, but he was indebted to Adams' quick reactions to claim a late equaliser. Birmingham, who have drawn a Championship-high nine matches this season, drop to 12th, while Hull, unbeaten in three, move up a place to 22nd. "We spoke at half-time and warned the players about Hull's situation, where now they had to come out and respond and to be ready for that, and we didn't do it. "That's six goals in two second-halves and that's not acceptable. We will go through it during the international break, understand why, work it out, and make sure we put that right. "You can have bad games or under perform, but you need to be able to do your job and the simple basics. We didn't get that in the second half and it cost us. "The important thing was that we needed to change the shape, to be a little more direct, and the players have applied themselves and showed desire. "We are in a position to win it and, low and behold, a mistake on a clearance drops invitingly for their player to go and score. "But the goals were honest mistakes. We have seen an honest team working their socks off for each other and that's going to take us a long way." Attempt missed. Will Keane (Hull City) right footed shot from outside the box is close, but misses the top right corner. Assisted by Todd Kane. Attempt missed. Lukas Jutkiewicz (Birmingham City) left footed shot from the centre of the box is close, but misses to the left. Assisted by Che Adams with a cross. Attempt missed. Lukas Jutkiewicz (Birmingham City) header from the left side of the six yard box misses to the left. Assisted by Connor Mahoney with a cross. Corner, Hull City. Conceded by Craig Gardner. Attempt blocked. Viv Solomon-Otabor (Birmingham City) right footed shot from the centre of the box is blocked. Attempt missed. Kamil Grosicki (Hull City) right footed shot from the right side of the box misses to the left.